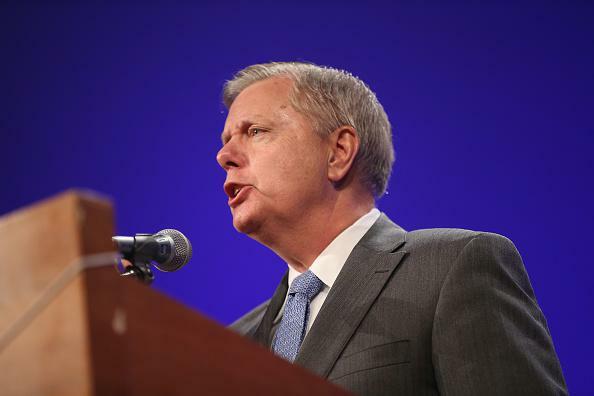 Lindsey Graham, John Kasich: Expected 2016 candidates among many others vying for ticket spot. Lindsey Graham speaks at the Republican Party of Iowa’s Lincoln Dinner on Saturday in Des Moines. Republican South Carolina Sen. Lindsey Graham said Monday that he will discuss his potential plans to run for president in a June 1 speech—then began an answer to a question on CBS’s This Morning with the words “I’m running because … ”—suggesting that he is, in fact, planning to join the large crowd of candidates competing for his party’s 2016 nomination. A report by ABC News, meanwhile, indicates that Ohio Gov. John Kasich is also planning a run that he’ll announce officially in June or July. Other announced or presumed candidates for the 2016 GOP nomination, in rough order of presumed electoral potential, include Jeb Bush, Scott Walker, Marco Rubio, Rand Paul, Rick Perry, Mike Huckabee, Ted Cruz, Carly Fiorina, Ben Carson, and Chris Christie.